Angela has several years of medical training in the field of cardiology. 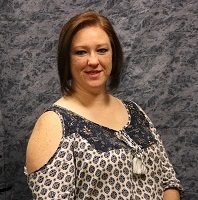 Angela is from Arkansas and is a pre-tester/technician at Brunswick Eye and Contact Lens Center. She helps to assist the doctors before the exam and helps patients with glaucoma studies in the office. Angela is married to he husband Roger and they have five children. She loves going on cruises and exploring all that God has created. In her spare time, Angela enjoys tinkering and fixing broken things and working on her truck and car.